My girls are fans of this author, who is known for her popular Chick ‘n’ Pug series. So, when I heard she was coming out with a new book, I reached out to the folks at Penguin Random House, to gets my hands on a copy to share with my girls, and include in my "Welcome in Spring with a Good Book" series. 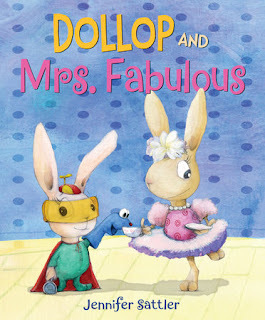 "Make way for bunny Dollop and her sister, Lily (otherwise known as Mrs. Fabulous), in this rib-tickling sibling story by the popular creator of CHICK ‘N’ PUG. It’s looking like just another boring day playing monster vs. monster when Dollop overhears her big sister, Lily, planning . . . a tea party? Lily is happy to have Dollop join her, as long as Dollop follows a few simple rules. There are no ninjas allowed and absolutely NO burping. But there is dressing up and sipping tea with your pinky finger in the air and making mindless small talk. Suddenly, what started out as a fun idea is nothing but a bunch of rules. Can these two unalike sisters find common ground? Warm, wacky, and endearingly illustrated, Jennifer Sattler’s latest book extols the virtues of sisters and the imagination." This book is perfect to share with siblings you never seen to get along. I know with my two girls, they can be happy playing with one another, and then the next minute stomping off to their rooms to be alone. But, even after being alone, they always find themselves coming back around and looking for each other to play with. I guess that is why they say siblings are built in best friends, as they are always there for each, even though they may get on their nerves at times. This book features two cute bunny sisters, who are so different. Can they find a common ground that will bring them together so that they can play and enjoy each others company? You will just have to pick up this cute picture book, that will have you laughing at times, as you enjoy yet another book from Jennifer Sattler. Both of my girls loved the book, especially the cute illustrations. And, they were reminded just how strong a bond they have as sisters, and how even though they may be different, they are sisters and that is a gift in and of itself, and one they should cherish, especially as they grow older.